Who loves Trivia? I do! I teamed up with my good friend and colleague Glenn Hebert – Host of Horse Radio Network, against Jonathan Oakes, the host of Trivial Warfare. Well……it was super harder than I thought! Trivial Warfare is like studying for the SAT’s! Jonathan has lived with weight issues his whole life…just like you and me! When Jonathan decided he wanted to find the woman of his dreams, he knew he had to start living a healthy lifestyle. Jonathan lost over 200lbs and found the woman of his dreams! Jonathan got married, had a beautiful son and soon…….he started living with old habits. Then Jonathan’s father passed away, and suddenly the weight started creeping back until he gained back the 200 pounds he had lost, and he gained even more weight. At the PodFest Multi-Media Expo in February of 2018, Jonathan and I began talking about my weight loss journey. Jonathan wanted to know how I was able to lose 60 lbs and keep it off. My answer was…….I “Live” a healthy lifestyle! 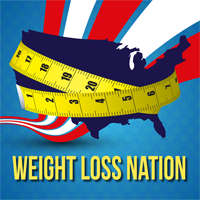 I am Weight Loss Nation, and I eat and breathe Weight Loss Nation. Jonathan decided he wanted to join Dave Jackson in the Weight Loss Nation Podcaster Challenge. Jonathan’s starting weight for the Challenge was 446 pounds. Jonathan has started his “transition,” and is making better food choices and doing physical activity that he enjoys doing and…..he’s talking to an expert about his weight issues. I’m so proud of Jonathan for wanting to “Live” a healthy lifestyle! Jonathan is the host and producer of the Trivial Warfare Podcast. Go to www.TrivialWarfare.com and listen to the game! See how good you are at Trivia! If you love podcasting and you’d like to meet other podcasters or learn about podcasting……you have to come to Podfest Multi-Media Expo in 2019! The conference will be in Orlando, FL in March of 2019. Meet me and other wonderful podcasters at this awesome conference! You will learn about food…REAL food. You will learn what effect different foods have on your body. So… join us as www.TheWeightLossNation.com and become a member! I look forward to seeing you in the private FB community and on the monthly seminar!